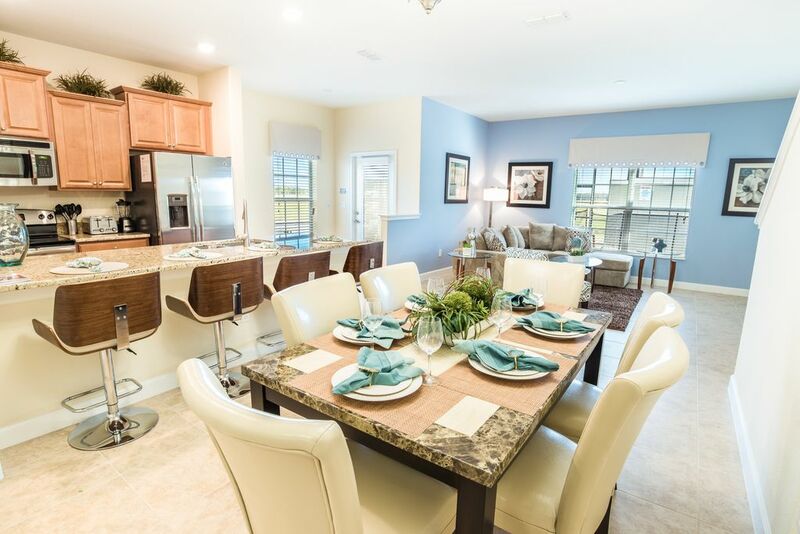 Welcome to our new townhome located in the Storey Lake Resort in Kissimmee, Florida. Upon entering the property, guests will be taken back by the beautiful décor. This townhome was designed by one of the top builders in the Orlando area. Guests will be able to enjoy all the modern amenities one expects in a luxury vacation rental. Tile floors, top of the line furnishings, stainless steel appliances, and beautiful décor offer an inviting experience for your vacation. This gorgeous 5 bedroom, 4 bath home has enough space for the entire family. The property has all the comforts of your own home. Enjoy a well equipped kitchen perfect for the chef in your group. There's plenty of seating in the dining room so the whole family can sit together. The living space offers enough room for guests to lounge and enjoy a movie, or replay all of the fun you had during the day. The bedrooms and bathrooms are plentiful to allow for many guests to stay in the property while still having their privacy. Tired from a day at the parks? Come take a dip in your own private pool and soak up the pristine Florida sun. Welcome to the fabulous Storey Lake Resort in Kissimmee Florida. This BRAND NEW RESORT offers everything to make sure your stay in Kissimmee is fun for the whole crew. All properties feature private pools, professionally decorated homes, and access to the beautiful clubhouse with stellar amenities. If you are coming into town to enjoy Disney, Universal, Sea World, shopping malls, or have business at the Orange County Convention Center, look no further! Storey Lake is located within minutes to ALL of these locations. You have a supermarket and a Wal-Mart within a mile, so everything is conveniently located close to the resort. Storey Lake has a 24 hour guard to make you feel secure while visiting this gorgeous resort community. Did we mention clubhouse amenities? Storey Lake has it all. There is a gorgeous community pool, lazy river, splash pad for the kids, water slides, hot tub, fitness center, putting green, volleyball, and optional canoe rentals for the lake right behind the clubhouse. There are docks located behind the clubhouse where one can take in the beautiful Florida scenery. You will not be disappointed with that this gorgeous resort community has to offer. Please inquire with any additional questions. Welcome to the fabulous Storey Lake Resort in Kissimmee Florida. This BRAND NEW RESORT offers everything to make sure your stay in Kissimmee is fun for the whole crew. All properties feature private pools, professionally decorated homes, and access to the beautiful clubhouse with stellar amenities. If you are coming into town to enjoy Disney, Universal, Sea World, shopping malls, or have business at the Orange County Convention Center, look no further! Storey Lake is located within minutes to ALL of these locations. You have a supermarket and a Wal-Mart within a mile, so everything is conveniently located close to the resort. Storey Lake has a 24 hour guard to make you feel secure while visiting this gorgeous resort community. Did we mention clubhouse amenities? Storey Lake has it all. There is a gorgeous community pool, lazy river, splash pad for the kids, water slides, hot tub, fitness center, putting green, volleyball, and optional canoe rentals for the lake right behind the clubhouse. There are docks located behind the clubhouse where one can take in the beautiful Florida scenery. You will not be disappointed with that this gorgeous resort community has to offer. Please inquire with any additional questions. 4 additional seat are located at the bar. Be sure to inquire with any additional amenities questions. This property is located close to Disney World, and all of Orlando's other attractions.